The Model 276B Current Transformer is a ring-type current transformer for currents from 50 to 1200 amps. The Model 276B has an accuracy rating of plus or minus 2% for 50-100 amp CT’s, and plus or minus 1% over 100 amps at 60 Hz. This CT also features a 25-400 Hz frequency range, #8-32 secondary terminals and mounting brackets. Polarity markings are stamped on the transformer. The Model 276B is UL Recognized and CSA Certified. 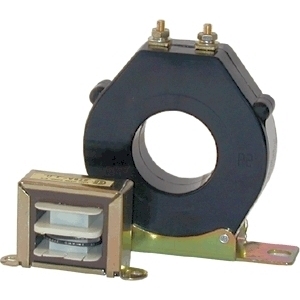 The Model 276A Current Transformer is a low-cost, open-frame type current transformer. For use with up to 8-gauge wire, and up to 40 amps on the primary. 2500VMRS insulation is standard. Frequency range is 25-400 Hz. The Model 276A CT is CSA Certified.